Window XP, the most popular Operating System in the world. 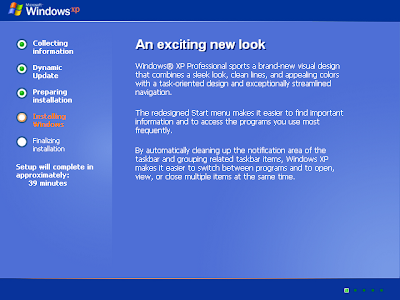 Even Window 7 and Window 8 has been launched by Microsoft but the users of Window XP are not reduced. Most of the Desktop users only use Window XP. Window XP is simple to use and that’s why most of the users use it. When we install Window XP it requires around 40 minutes to set itself up. The installation time can be reduced to near 15 minutes. 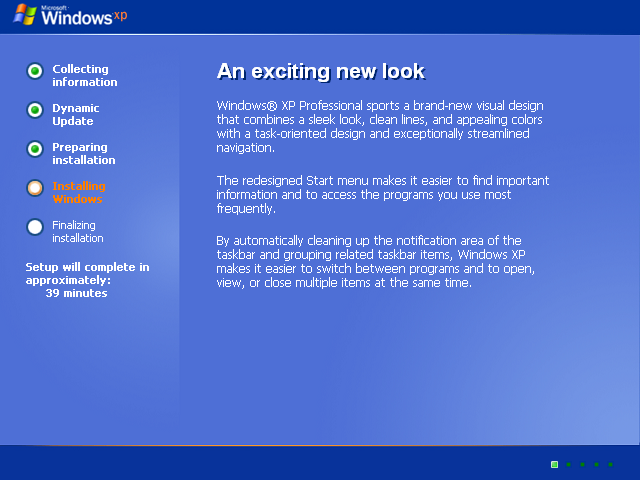 This will be particularly helpful for those who frequently setup Windows XP. Step 1. Boot from Window XP disk. Step 2. After the setup has copied all the files which are required for installation of Window XP, it will prompt you to indicate a location to install the OS. Step 3. After having selected the drive, the setup would now format it and reboot. Step 4. On reboot, the installation starts and the screen will tell you that you require around 40 minutes to complete the setup. Step 5. Now press Shift + F10 to bring in a Command Prompt Window. Type “taskmgr” (without quotes) which will open up the Task Manager. Step 6. In the Task Manager, click on the Processes tab. Search for a process named Setup.exe. Step 7. Right click the process and set its priority to ‘High’. That’s it, now the installation will be faster and will complete within 15 minutes approximately.